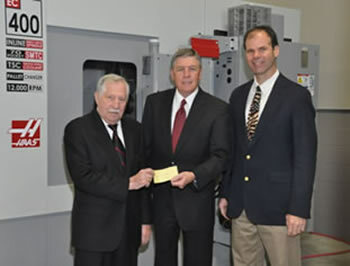 As a result of the success of the Vincennes University Haas Technical Education Center (HTEC), the third year Advanced Manufacturing Program, and the completion of the Indiana Center for Applied Technology (ICAT) building on the VU campus, and a $1.5 million donation by local businessman Frank Ladner, Haas Automation entrusted Vincennes University with the opportunity to become North America's first HTEC teacher training and certification center. It also provides CNC training opportunities for incumbent workers, veterans and other adult learners. Extensive and significant partnerships with Haas and other industry leaders enable the HTEC Teacher Training Center to have the resources to deliver high quality training in many aspects of CNC machining and related technologies. For a complete list and description of our partners, please see our "Partners" page. Vincennes University (VU) HTEC CNC Teacher Training Center is North America's first HTEC Teacher Training and Certification Center. Contact us today to learn more about the Center's training services and resources.
" I highly recommend this training for all levels of instructors from new to experienced!"